The 2010 BP oil spill in the Gulf of Mexico caused an unprecedented number of fatal diseases in roughly 1,300 dolphins over the course of five years, according to a new study by the National Oceanic and Atmospheric Administration. Up to now, the link between oil spill exposure and dolphin deaths has been inconclusive, but this study changes that. The results are from a forensic investigation that was part of NOAA’s long-term ecological analysis of the Deepwater incident that began in 2013. The spill itself leaked 4.9 million barrels of oil into the Gulf over five months in 2010. “No feasible alternatives remain that can reasonably explain the timing, location and nature of this increase in death,” co-author Stephanie Venn-Watson of the National Marine Mammal Foundation in San Diego said in a Wednesday press conference. BP has always challenged the claim linking the oil spill to dolphin deaths, but the study examined unusual mortality events (UMEs) in which large numbers of dolphins perish in a short time frame and from similar causes. Afterwards, researchers drew firm conclusions about the die-offs. The NOAA team examined the major organs of 46 dolphins that had died along the coasts of Louisiana, Mississippi and Alabama from June 2010 to December 2012. Researchers then compared results to a control group of 106 dolphins that had washed up off the coasts of the Carolinas between 1996 to 2012, or those found off the coasts of Florida and Texas prior to the Deepwater oil spill. The researchers said that as the dolphins swam to the surface for air, oil fumes and liquid petroleum leaked through their blowhole, into their lungs, and caused disease. They also found the mammals had shrunken, thinner adrenal glands never observed before in Gulf dolphins. Adrenal glands produce hormones to help the body cope with stress. “Animals with untreated adrenal dysfunction can essentially be balancing precariously on a ledge, waiting for the right stressor to push them into an adrenal crisis,” Venn-Watson said. That kind of stress can come from dealing with cold ocean water, pregnancy or fighting infection. When comparing the results to the control group, only one in 50 from other parts of the Gulf had evidence of bacterial pneumonia. “Aside from chemical exposure, conditions that can cause adrenal dysfunction are cancer, autoimmune disease and tuberculosis. We didn’t find any of these additional causes,” Colegrove said. The worst injuries were spotted in Barataria Bay, Louisiana — 40 miles due south of New Orleans. This location was hit hardest by the spill, with oil coating close to 25 miles of shoreline. For its part, BP questioned whether other factors were to blame. 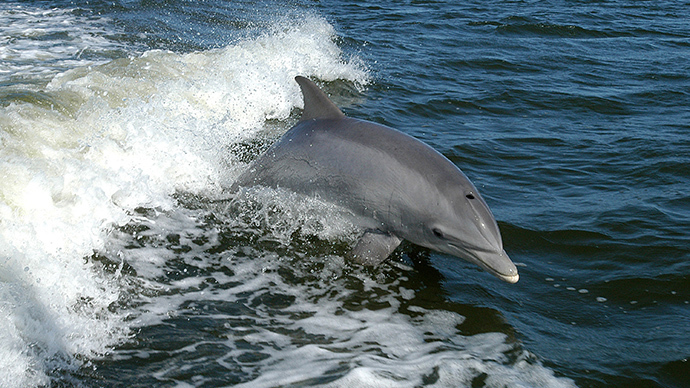 “The data we have seen thus far, including the new study from NOAA, do not show that oil from Deepwater Horizon accident caused an increase in dolphin mortality…Even though the UME may have overlapped in some areas with the oil spill, correlation is not evidence of causation,” said Geoff Morrell, BP’s senior vice president for US communications, in a statement.